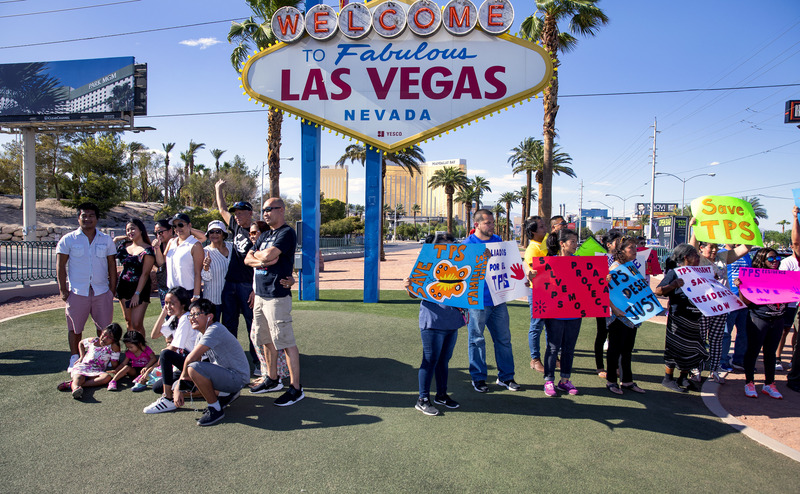 It was 104 degrees at the Welcome to Fabulous Las Vegas sign on Tuesday afternoon, but the oppressive heat wasn’t stopping several dozen activists who had just disembarked from a colorful tour bus from chanting enthusiastically in front of the iconic attraction. “Down, down, with deportation! Up, up, with liberation!” an organizer shouted through a bullhorn as the activists bobbed up and down. The protesters who stood just feet away from tourists posing for photos were part of a nationwide bus tour that started last week and is advocating on behalf of Temporary Protected Status (TPS) beneficiaries who are on the brink of losing their legal status. Among those on the 53-city tour is Edwin Murillo, a native of El Salvador who quit his job and is letting his 5- and 11-year-old daughters miss school to participate in the cross-country odyssey. Last year, President Donald Trump’s administration announced it would be either cancelling or giving a final extension on legal status to hundreds of thousands of TPS beneficiaries from countries including Yemen, Nepal, Haiti, El Salvador, Nicaragua and Honduras. Under the program, people who had been living in the U.S. when their home countries were struck by natural disasters or major conflict, and who were in danger if they went home, were allowed to live and work legally in the U.S. 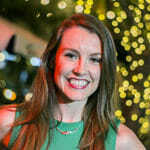 But while the program is designed to be temporary and the Trump administration says conditions in those countries have sufficiently improved, many recipients — especially the hundreds of thousands from El Salvador who have had the protection for nearly two decades — say they’ve set down too many roots in the country to be sent back. 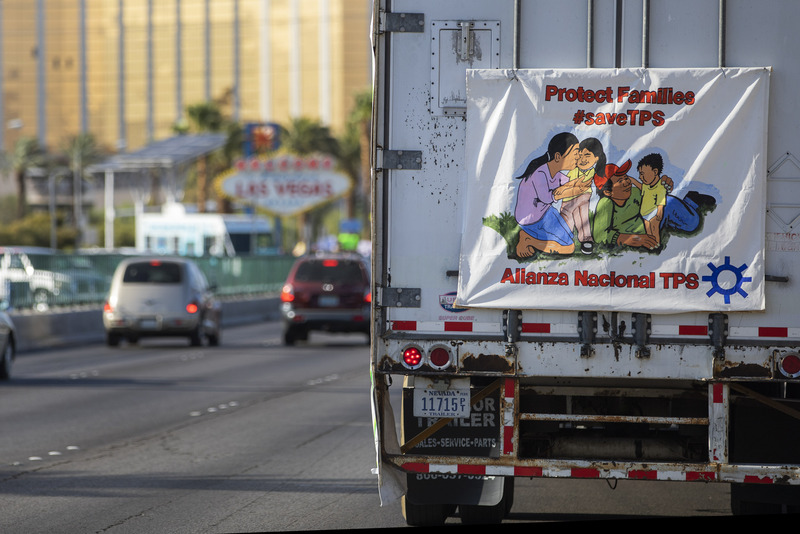 About 270,000 American citizen children have at least one parent with TPS, and Murillo said he’d rather risk deportation than bring his children to a country gripped by organized crime. “I have the decision to be chased out by ICE, or chased out by crime,” he said. He wonders aloud about what the government will do with all the TPS recipients who will soon become undocumented, as well as their children. He’s also optimistic that the court system will ultimately rule in favor of what’s best for the children hanging in the balance. He’s not done fighting. Aside from the advocacy tour, the fight for TPS is taking shape in the courts. 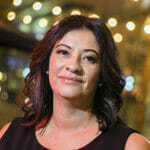 Ten TPS recipients from El Salvador, Haiti, Nicaragua and Sudan, along with five American citizen children of TPS recipients, sued the government in March over the program’s cancellation. They’re backed by the ACLU, the National Day Laborer Organizing Network and the law firm of Sidley Austin. The plaintiffs argued that the Trump administration’s interpretation of the program’s rules is unconstitutional, and derives from an anti-immigrant agenda. One of the defendants is Orlando Zepeda, who also joined the bus tour. Originally from El Salvador, Zepeda is the father of a 12-year-old daughter and a 15-year-old son, the latter who is also a plaintiff. Zepeda said that the cancellation of TPS had affected all of his family, especially his American-born children, who have found it difficult to focus on school amid the uncertainty of what’s going to happen when their parents’ legal protections end next September. He said that the caravan, with about 50 travelers, began in Los Angeles last Friday and that the trip is divided into six weeks on the West Coast and another six in the East Coast for a total of three months. 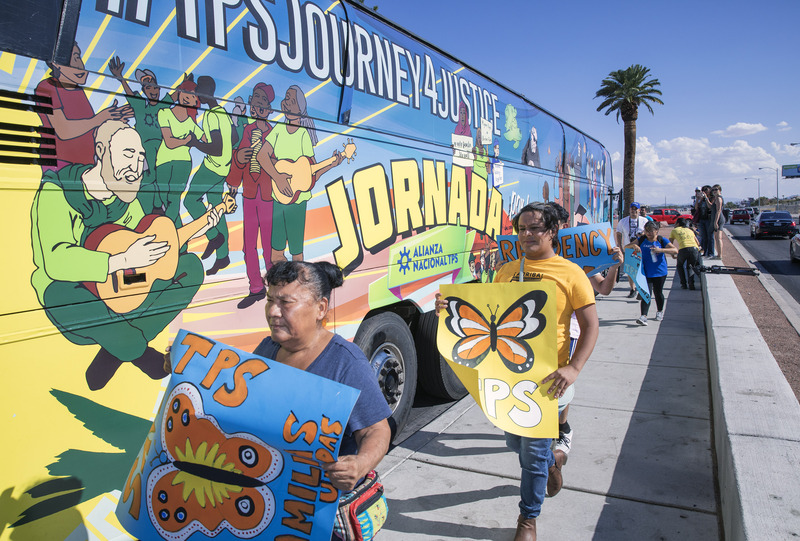 The bus stopped in Las Vegas in part because the city has its own TPS advocacy committee that has been active on the issue, organizing a lobbying trip to Washington, D.C. among other activities.